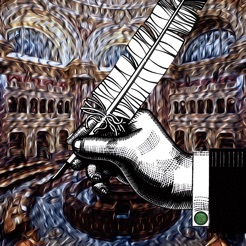 Literary Analysis Guide is a reference tool for students of literature, rhetoric, and writing. 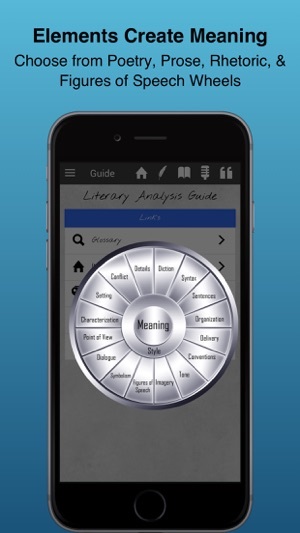 The elements of literature are arranged around three clickable interface wheels. Touch any term on the wheels for a detailed definition, examples from literature, questions to ask, and an example essay paragraph which analyzes that term. 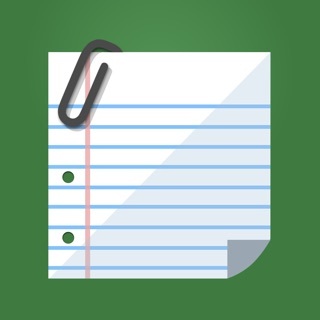 Students can also reference an illustrated version of each analysis paragraph which highlights the topic sentence, textual evidence, and analysis portions of text. 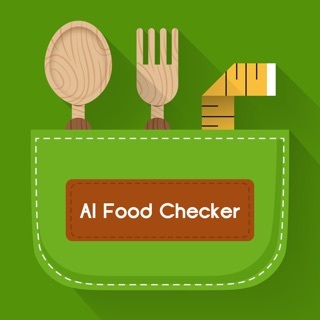 Twelve of the most commonly used figures of speech are presented around a fourth wheel, and students can look up less common literary devices in a full glossary of literary terms. 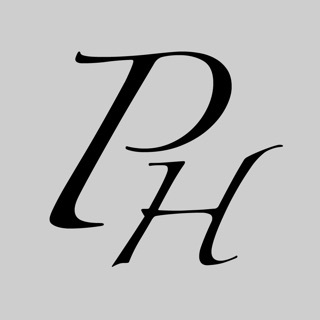 In an expanded section on meaning, students can reference the proper sequence of literary analysis, patterns of paragraph development, and common elements found within successful literary analysis essays. 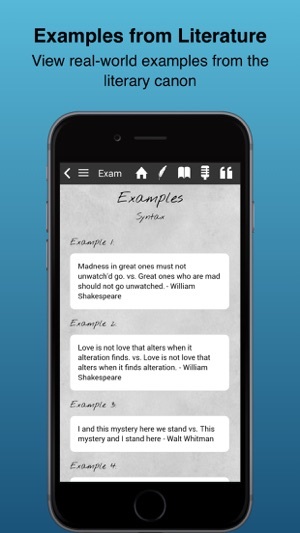 Literary Analysis Guide has helped students visualize how the elements of literature develop style and meaning since the beginning of the smartphone revolution. Now with illustrated example paragraphs for all major terms, users can see literary devices at work within properly written analyses. 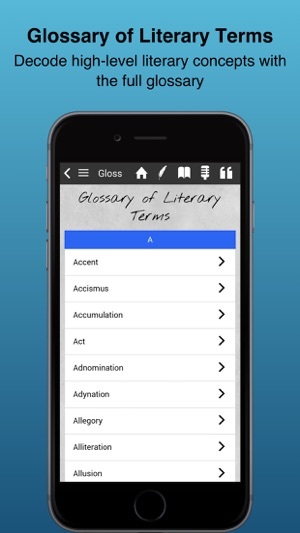 Also, with a full glossary of literary terms, students can now search for the meaning of more esoteric literary concepts including a broadened selection of figures of speech, poetic forms, dramatic forms, tropes, schemes, techniques, and various forms of literary criticism. 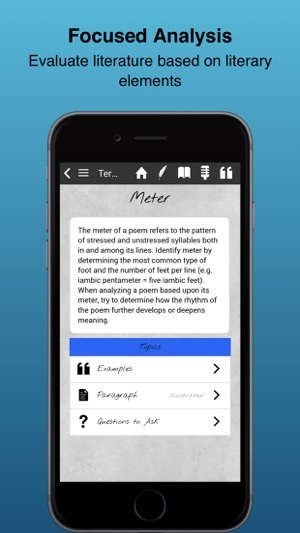 Whether preparing for the Advanced Placement (AP) English Literature exam or composing a graduate-level thesis, this app will help you on your way. 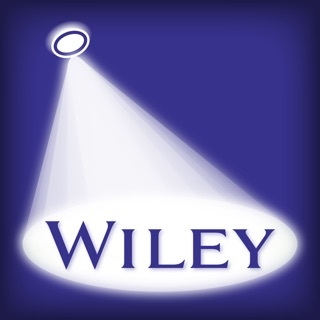 Literary Analysis Guide was developed by a college English professor with extensive secondary experience and is appropriate for all levels from secondary through university-level academics. Overall this app is worth the money to get a quick look through to freshen up your mind or if you don't need to completely understand the terms. I am running iOS 8.4 on an iPad Air. 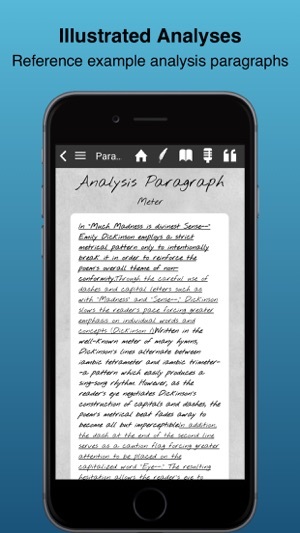 Your app, Literary Analysis Guide, keeps freezing. I have the paid version. Please fix.